Yesterday, Girl Scout Junior Troop 61842 worked towards their Bronze Achievement award by making pleas for positive changes in their environment and community at Oak Knoll School. 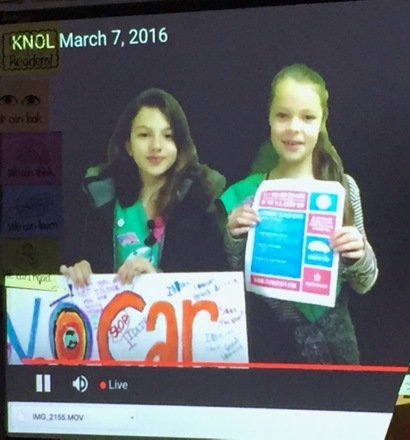 In the morning, Scouts Sophia and Cleo (pictured right) presented the project to their school via the KNOL closed circuit TV station. In the afternoon, many of the girls walked the carline and streets surrounding the school to educate drivers and politely ask them to stop idling. A favorite data point shared was that only two minutes of idling uses the same amount of fuel as it would take to drive one mile, not to mention the harmful effect it’s having on our environment. I love this – can you come to Encinal next?! It makes me crazy when there are so many cars just sitting there with their cars running while waiting for their student. Good job spreading awareness Girl Scouts!